A Village caroling tradition, a green Christmas, and klezmer! Come caroling at the Washington Square Tree. 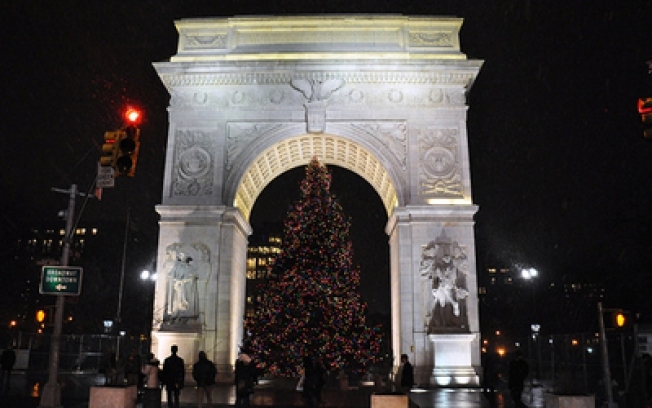 TRADITIONAL: Ignore all the construction in Washington Square Park and focus on the arch, the tree, and remembering the words to God Rest Ye Merry Gentlemen for the Christmas Eve Carol Singing with the Rob Susman Brass Quartet. 5:30PM. ALL ABOUT JEW: For those not spending their evening hanging their stockings by the chimney with care, Ben Holmes brings you his Coincidental Night of Klezmer at Park Slope's Barbès. 10PM. ELECTRIC: Did you know you can make the electricity that'll juice the Times Square 2009 sign? Head over to the Duracell Power Lodge (1540 Broadway at 45th St.), hop on one of those stationary bikes and make it a very green Christmas. Until 9PM.